| Material : 100%Silk. | Condition : 5/6 little hole on photo 6. 4/6 - good condition. may have little spots of dirt, small holes itp. 5/6 - very good condition - normal, little signs of used. Hugo Boss Black Shirt. 80% Silk 20% Linen. Material: 70% Silk, 30% Cotton. Colour: Black. Machine Washable. Length - 28 in. 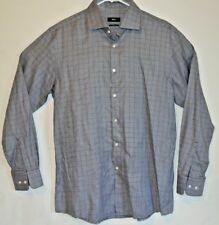 Gray Hugo Boss 100% Silk Long Sleeve Button Down Size Large. - 100% Silk. - Dry Cleaned. - Front Chest Pocket. Authentic Piece. Colors may not be exactly as seen due to difference in monitor color settings. Looking for amazing deals on name brand clothes!!!!!! Check out my store. Button Up Shirt Striped Long Sleeve Shirt. Very nice casual shirt from Hugo Boss with thick silk weave. A short sleeved shirt crafted in cooling material by HUGO Boss Golf. Cut to a narrow silohoutte with a spread collar and a patch pocket for modern appeal. Material: 100% Silk. Color: Green. No Freys, Stains, Rips or Tears. Hugo Boss Cream Button Down Silk Shirt Size S. Condition is Pre-owned. Shipped with USPS First Class Package. But sizes 14,16 and 18 can wear for a slight oversized look depending on how oversized you're after. Used lightweight 90's Hugo Boss Silk shirt. Sizing scales differ in different parts of the world (e.g. a USA Large is a UK XL or a Japanese 46 is a UK 44).